Would You Magnetize Your Brain? 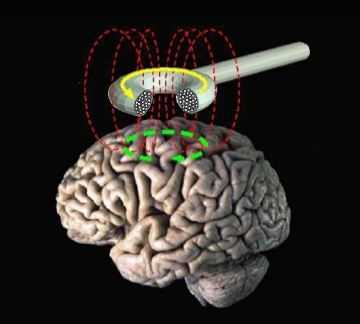 Transcranial magnetic stimulation (TMS) is a procedure traditionally used to “measure the connection between the central nervous system and skeletal muscle” these types of treatments can help assess the damage is people with a wide variety of neurological disorders (wiki/Transcranial_magnetic_stimulation ). More recently it has been trialled to alleviate the symptoms of multiple disorders. As a treatment method for chronic conditions, patients undergo repeated rounds of a magnetic field generator placed on top of the scalp. Pain management is one of the more recent additions to the TMS trials. Clinically, TMS is most widely approved and used to treat depression. The procedure is non invasive, has no major side affects ( headache, muscle twitches), and has repeatedly been proven more effective than a placebo magnetic. However, it should be questioned as to if this enough evidence for taking the chances of electrically altering ones brain? A review of the literature notes consistent, but moderate improvements. When the placebo effect is factored out of the improvement scores, the results are quite small. There are no in depth studies on the potential long term side effects of TMS. Given that research has shown improvements from TMS are relatively long term, lasting months after the initial treatments, it can be concluded that TMS initiates long term changes to the central nervous system. This could be wonderful news if the therapy was solely directed at pain circuits, however it’s impossible for the procedure to work with such specificity. There’s evidence that the frequency and positioning of the magnet play a role in targeting specific symptoms, but this is all being done in an exploratory fashion. There are no guidelines or explanations for why different areas or frequencies of the magnetic are relevant for treating different ailments. The majority of success testimonials are from patients with depression. It is unclear if depression was screened for in the TMS studies for pain. Considering that chronic pain patients secondarily develop depression at a rate several times higher than the average person, it seems especially important to remove this variable from the TMS trials. The good news is if you’re a chronic pain patient with depression, this procedure has the potential to target both. It should be important for anyone considering these types of treatments to analyze the risk- benefit ratio and keep in mind that scientists have no idea how these procedures actually effect the brain. “The magnetic field affects the electrical signaling used by neurons to communicate, but how exactly it improves symptoms is unclear—scientists suspect rTMS may redirect the activity of select cells or even entire brain circuits (scientificamerican.com ) . ” TMS was only developed in 1985 and is albeit it being magnitudes milder, it’s only a few short steps away from electric shock treatments. Especially given that TMS is active on the cerebral cortex, the part of the brain that is the essence of what defines a human being, I’ve concluded that at this time TMS for the treatment of chronic pain is not a reasonable approach. TMS is it currently approved to treat major depressive disorder, heavily researched for post-traumatic stress disorder, bipolar disorder and Parkinson’s disease and is currently being investigated for schizophrenia, anorexia, Alzheimer’s disease, autism and cerebral palsy. Until TMS can specifically target pain, I’m terrified to think that that anyone would voluntarily and repeatedly subject there cortex to a high powered magnet for such purposes. Hopefully the future will bring greater understanding of how magnets can safely and specifically interact with neural networks and TMS treatments will be available to patients in need.